Fixed an issue with restoring files from a LimoWiz backup, where email database was not restored from backup file. Fixed an issue sales contract payroll reports. Fixed passenger search by home phone, work phone and cell phone, when browsing for passengers of a certain account. Fixed an issue with multi-trip billing reports. Pre Confirm email and Thank You email options on dispatch window. See check boxes next to email button (bottom right of window). Pre Confirm and Thank You outgoing text files must be created and customized in the LimoWiz Settings window - HTML Email Terms tab page. This must be done to have the intended effect for communicating the message to your customers. See How Video Tutorial. Accounts Payable Contact now has an email address. Therefore, you can send confirmations and invoices via email. Accounts Payable Contact can be sent as a fax or a PDF email just like the account, passengers and account contacts from the Fax menu. Miles and Rate/Mile can now be carried over (via F10 or Ditto button) when doing a round trip. New Search Box on account and passenger Stored Routing window. Limousine company address is now entered in a free form to provide flexibility and end user customization when printing reports. Multi-Reservation "Trip Status" Update. Set the Trip Status of a group of tagged (selected) trips in ONE single click. First tag trips by clicking the checkbox in the T column, then double click any trip to display the Trip Status window. Double click the trip status, for example: D, the tagged reservations Trip Status will be updated on Dispatch window. Driver Que List. Select from available drivers to add to Driver Que List and assign drivers to trips on dispatch window via a mouse double click. The Que List is saved automatically upon closing the driver que window, so the Que List is preserved and retrieved when the window is opened again. Added a new Find trips option by First Name. Optimized the LimoWiz program for further speed and better memory handling. Increased account's Attention line to 35 characters up from 20. The word ATTN will not print; this field will be used for other purposes when printing customer address on invoices and other reports. Disallow closing of account change window while account change process is still working. This is to prevent runtime errors and ensure proper completion of account change for all related records. 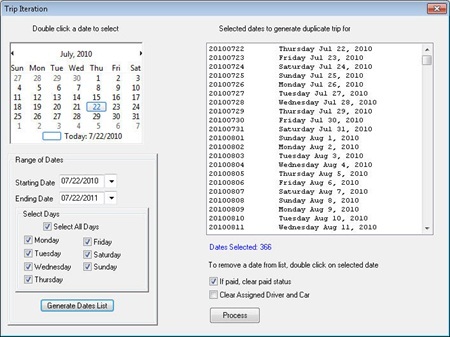 Trip Iteration over a range of dates with day of the week selection. HTML email confirmation will not include customer phone numbers by default. If you want to include the phones, see Settings, Email Account tab, click the Include Account, Passenger and Contact Phones on Confirmations. LimoWiz MailBox (Sent Items) now provides the capability to browse to Previous and Next Email item. See Image below. Added the option to "Resend Email". This can be helpful when a customer disputes an message was sent. There is a checkbox for previous message header information which includes the date and time the message was sent. It also include the To and From and Subject line. The above two features are only available when using the LimoWiz Email Engine. Fixed Daily Gross total on dispatch window. Discount was subtracted twice. A/R window was not resetting trip display properly after a trip edit. Fixed printing of Drop-Off time on some reports. Fixed printing of drop-off time on some reports when it is set to 12:00AM. New option to print trips with pay method of Complimentary, Free and Gift, on invoices..
See checkbox next to the Pay Method on trip window (bottom right of window). Added confirmation prompt when sending a credit card payment confirmation on multi-trip payment window. Added Payment Logistics gateway for credit card processing. MerchantWare, Authorize.NET, Payment Logistics, SagePay and PC Charge Pro. Service Tax Per now uses 3 decimal digits. Credit card numbers are now encrypted upon saving. Only administrators and authorized users can view full credit card numbers by hovering mouse over encrypted card number, then pop-up window tooltip will show credit card number for 5 seconds. By default no users are allowed to see full card number. Access is allowed by updating user restrictions on his/her profile which must authorized by administrator. Passwords must now be a minimum of 8 characters long and must contain letters and numbers. This is required for PCI compliance. Fixed hourly price calculation issue on trip window. Some new payment methods were not printing on reports or emails. Fixed. Dispatch window improved speed especially in the LimoWiz network version. Descending display of trips is now off by default. To turn on, see Settings - Dispatch tab page. Phone numbers now use free format. Hyphens and dots if needed must be entered by end user. This is needed to address international phone number and for compatibility with LimoWizOnline Internet reservations module. Corrected some with contact credit numbers and authorize.net interface and better processing status messages. Added phone numbers on printed confirmations and email messages. Fixed an issue with Pay Method when recording payment for non credit card transactions such as CASH, CHECK. Pay method was not saved correctly. Added "COMPLIMENTARY" pay method to trip window. In some situations credit card list was not populated on A/R window. Fixed. Corrects some issues in 10.1.4 of printing of Waiting Time description in multi-trip billing. Fixed saving of credit card numbers into payments table when using the OFFLINE feature. NEW: Added the word OFFLINE to payment transaction description when trip is paid off-line or manually. Fixed account number change behavior where account references on file were not updated to new account number. Optimized A/R window and better speed. Reduced program dynamic memory requirement. NEW: Added Trip Status drop down list to trip window - next to account number. NEW: Added prompt (Yes/No) when clicking the Quote button trip window. Button renamed to Email Quote. This button also saves the price quote. NEW & IMPROVED : Quote Copy/Paste button. This is for users who do not want to save the price quote as a reservation. NEW: Added PAID status to manual payroll items. NEW: Added prompt "Exclude Unsettled Trips" for account outstanding report . See Reports menu - Account Reports. NEW: Waiting Time text can now be changed. See Settings - 2nd tab page. Updated the program runtime components to latest version. This provides stability and speed. New QUOTE button on trip window to email trip quotations in HTML format. Excellent if you have the LimoWizOnline web module. The terms and conditions for the Quote can be entered in the Settings, HTML Terms tab page. Updated multi-trip and single trip payment windows. Mailbox was not deleting email. Fixed. New Transaction button was disabled on account consolidation window after processing at least one account. Fixed. Added "Full Report" option to billing window. This allows easy switching among reports types without exiting the window.